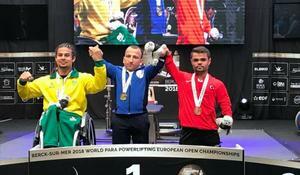 National Paralympians have claimed four medals, including two gold and two bronze at 2018 European Open Para Powerlifting Championship held in Berck-sur-Mer, France. The European Powerlifting Championships was held in Baku on June 12-15. Azerbaijan's powerlifter Elshan Huseynov has won the bronze medal at the Powerlifting World Championships in Dubai on April 11, Azerbaijan's National Paralympic Committee reported.